'Central Australia' is among the most majestic paintings of the series that emerged out of Nolan's visit to Central Australia during 1949. Nolan himself stated to Professor Ford, who purchased this painting from Nolan's 1950 solo exhibition at David Jones' Art Gallery, that 'in many ways it was, I think, the most complete statement I was able to make on Central Australia'. 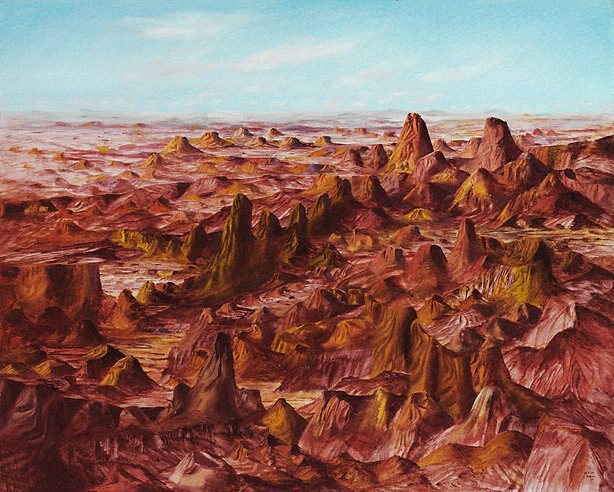 Like other paintings of this series, it arose out of Nolan's experience of flying over inland Australia, accompanying mail runs to remote settlements. Using an aerial viewpoint to increase the sense of vastness, his painting celebrates the extraordinary beauty of desert colour, form and light. Signed and dated l.r. corner, red oil "18.3.50/ Nolan". F.L., The Sydney Morning Herald , 'Prize-winning paintings in Archibald and Wynne contests', pg. 3, Sydney, 20 Jan 1951, 3. NOTE: Review of Archibald and Wynne competitions. James Gleeson, Sun , 'Dobell painting is "superb"', pg. 4, Sydney, 20 Jan 1951. NOTE: Review of Archibald and Wynne competitions. James Gleeson, Sun , 'Landscapes triumph for Aust. artist', pg. 19, Sydney, 31 Mar 1950, 19. 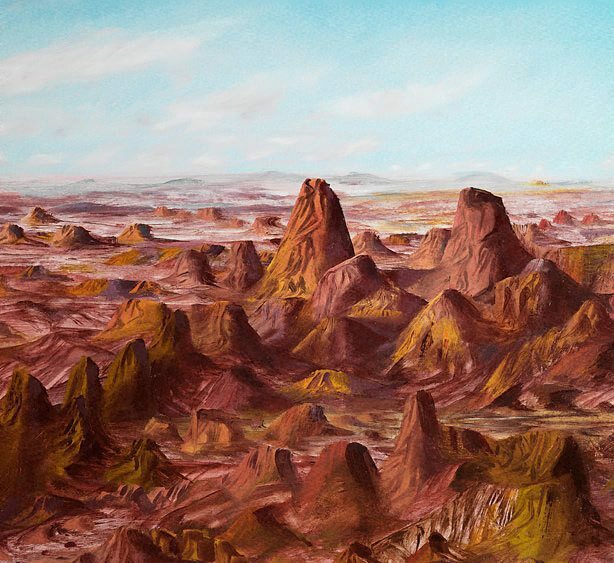 NOTE: Review of 'Sidney Nolan: exhibition of Central Australian landscapes', held at David Jones Art Gallery, Sydney. James Gleeson., Sun , 'Mediocre Archibald paintings', Sydney, 21 Jan 1950, 3. NOTE: Review of Archibald Prize. Art Critic [Paul Haefliger]., The Sydney Morning Herald , 'Archibald Prize: Avan artist wins Archibald Prize with chance work: Paintings 'Conservative'", Sydney, 21 Jan 1950. NOTE: Review of Archibald Prize. Christopher Heathcote, Encounters with Australian modern art , 'Reconstruction culture 1945-1962', pg. 9-56, South Yarra, 2008, 20, 21 (colour illus. ), 22. NOTE: Related work reproduced: titled 'Lagoon', 1950, private collection. Peter Hill, The Sydney Morning Herald , 'Mix 'n' match', pg. 18, Sydney, 15 Jan 2005-16 Jan 2005, 18. NOTE: Spectrum supplement of Saturday's edition. Terry Ingram, The Weekend Australian financial review , 'Nolan emerges from Kelly's shadow', pg. 40, Sydney, 22 Jan 2005-23 Jan 2005, 40 (colour illus.). NOTE: 'Smart money' section. Clare Morgan., The Sydney Morning Herald , 'Gallery sells off the family silver and strikes gold', Sydney, 21 Dec 2004, (colour illus.). NOTE: Two reproductions of work: one image shows 'Central Australia' on display with Judith White, Nelson Meers, Sam Meers and Edmund Capon in front of work. John Olsen, Art and Australia (Vol. 44, No. 2) , 'Artist's choice: Nolan and the Central Australian landscape 1949-50', pg. 212, Sydney, Dec 2006-Feb 2007, 212, 213 (colour illus.). Krystyna Pollar., The Australian , 'Nolan the nation's "greatest painter"', Sydney, 19 Dec 2004. NOTE: This article also appeared in Melbourne's 'Herald Sun' and 'Daily telegraph', Adelaide's 'Advertiser' and Brisbane's 'Courier mail', on 19 December 2004. Sebastian Smee., The Australian , 'Gallery makes room for foundation's gift of Nolans', Sydney, 21 Dec 2004, (colour illus.). Image shows 'Central Australia' on display with Judith White, Nelson Meers, Sam Meers and Edmund Capon in front of work. Jill Sykes, Look , 'Nolan's Australia', pg. 28-31, Sydney, Oct 2004, front cover (colour illus., detail), 7 (colour illus. ), 28-29 (colour illus. ), 30. Daniel Thomas, The Sydney Morning Herald , 'The poetic themes of Sidney Nolan', pg. 15, Sydney, 09 Sep 1967, 15 (colour illus.). Sidney Nolan , Stockholm, 1976, 20. Art and Australia [vol. 5, no. 2] , Sydney, Sep 1967, 455, 456 (colour illus.). NOTE: Owned by Professor Sir Edward Ford. Sun , 'Gentlemanly jackeroos [sic]: wash of Archibald Prize', Sydney, 26 Jan 1950, unknown. Encyclopedia of Australian art (Vol.2, L-Z) , Hawthorn East, 1984, between pages 848 and 849 (colour illus.). Art Gallery of New South Wales: highlights from the collection , Sydney, 2008, 100-101 (colour illus.). The new McCulloch's encyclopedia of Australian art , Carlton, 2006, 733 (colour illus.). Look , 'Doing justice to Nolan', pg. 8, Sydney, Mar 2005, 8 (colour illus.). NOTE: Reproduction shows Nelson Meers and Sam Meers in front of the painting. Art Gallery of New South Wales annual report 2005 , Sydney, 2005, 28. Art Gallery of New South Wales Annual Report 2004 , Sydney, 2004, 19-20. Sidney Nolan: such is life , Melbourne, 1987, 109-114. NOTE: Discussion of Nolan's trip to Central Australia and the series of landscape paintings. The artist & the desert , 'Sidney Nolan', pg. 58-60, Sydney, 1981, 58-60. NOTE: Discussion of series of Central Australian landscapes and David Jones' Gallery exhibition in 1950. Sidney Nolan - Australia , Sydney, 1979, 13. NOTE: General reference.